I woke up today with every intention of going out to get school supplies. Then I noticed the sun was out. Now, that might not sound like a big deal to anyone in the lower 48 at the beginning of August. 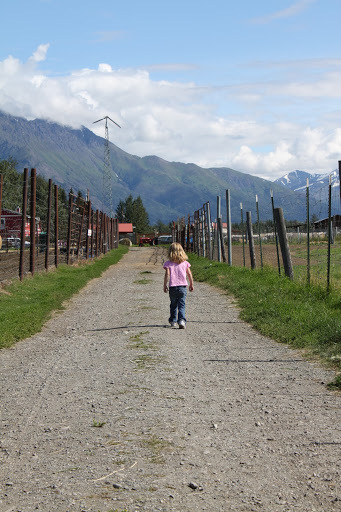 While you all were experiencing serious drought, we were wondering what in the world we had gotten ourselves into by moving to Alaska: dark all winter, rainy all summer. Needless to say, when it’s sunny, we take full advantage of it. 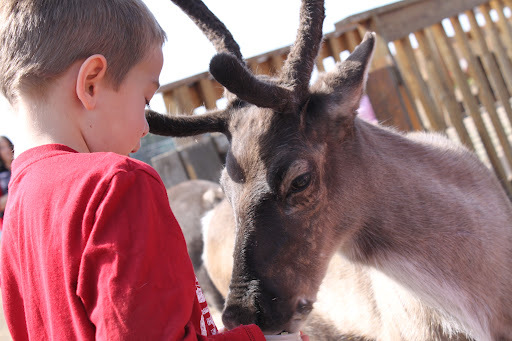 We decided to put school supplies on the back burner and took a trip up to Palmer to the reindeer farm. 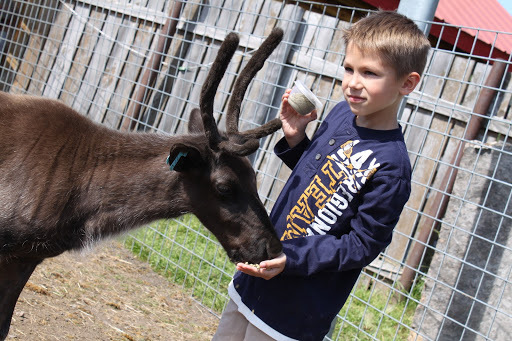 Because where else is there a reindeer farm?! It was about 30 minutes from our house in Eagle River and a beautiful drive. I just read The Hobbit and they were always talking about “the shadow of the mountain” and that’s exactly what this was like. Without the goblins and dragons and what not. 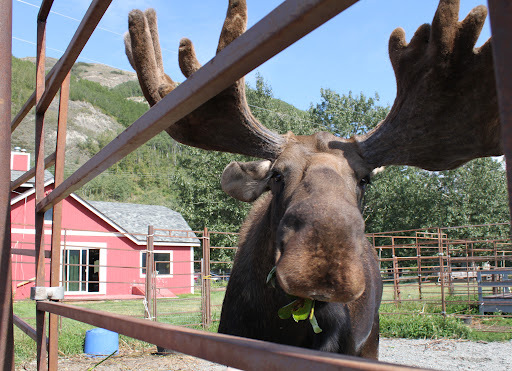 Anyways, we grabbed a quick picnic lunch and took “the tour” which is code for “feed the reindeer and moose and get face to face with a bison”. 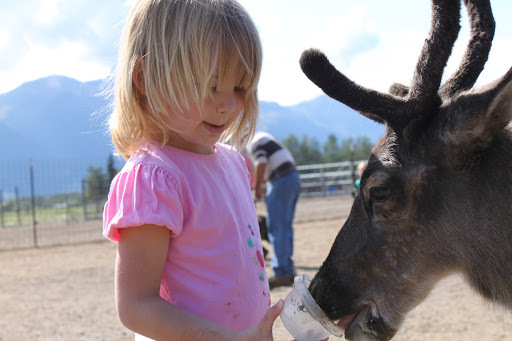 It took Grace a minute to get used to the not-so-patient reindeer trying to get the food out of her hand. And the slime. Generally, it just wasn’t her cup of tea. It’s safe to say Grace will never live on a farm. 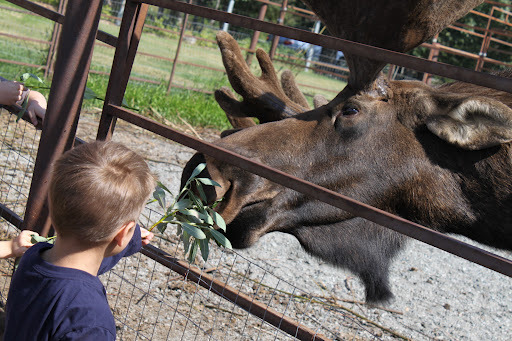 Next, we met Denali, a four year old moose. Denali was found in the wild and picked up and cuddled, because, duh. Then his momma came back for him but wanted nothing to do with him because he smelled like humans. This farm took him in and raised him so he’s super sweet and friendly. Our guide made sure to remind us never to feed a wild moose. 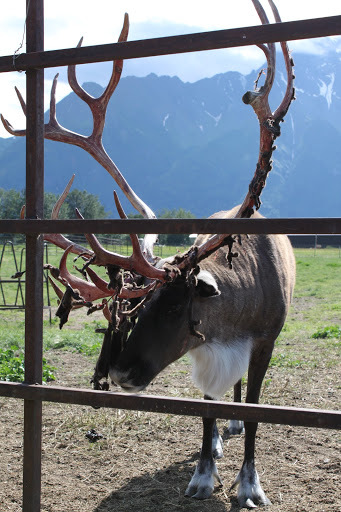 Here’s what happens to reindeer antlers before they fall off. Did you know they have to grow new antlers every year? Reindeer have velvet on their antlers that sheds off every year. You can’t really see it in this picture, but it’s all bloody and nasty looking. And finally we came to the elk. 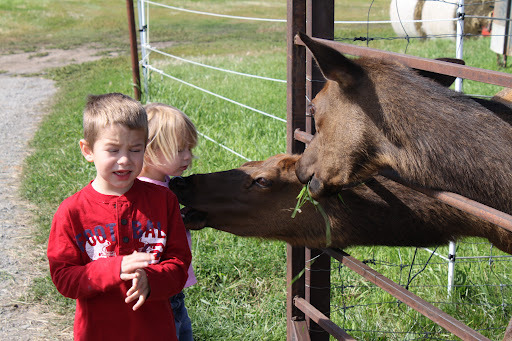 The elk had just had babies and the guide warned us not to put our hands in the fence because they could be aggressive, but we could pick grass and feed them if we wanted to. And we wanted to. 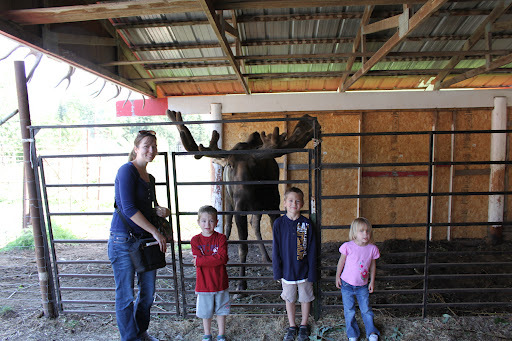 Now here is the reason Grace didn’t like the farm today. She was SO mad. I just happened to catch it with the camera. It tried to eat her! It also tried to eat Sam and some other girl with a long pony tail. Sam thought it was funny. Grace did not. She said she was walking home. It’s a rough life.